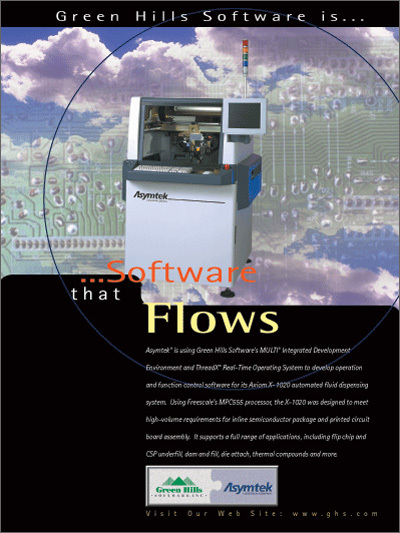 Asymtek® is using Green Hills Software's MULTI® Integrated Development Environment (IDE) and ThreadX® Real-Time Operating System to develop operation and function control software for its Axiom X-1020 automated fluid dispensing system. Using Freescale's MPC555 processor, the X-1020 was designed to meet high-volume requirements for inline semiconductor package and printed circuit board assembly. It supports a full range of applications, including flip chip and CSP underfill, dam and fill, die attach, thermal compounds and more.